We spent nearly a week in the Alps, however for the first 3 days there was a blizzard and so we couldn’t take the kids up to the top of the mountain to see the snow. 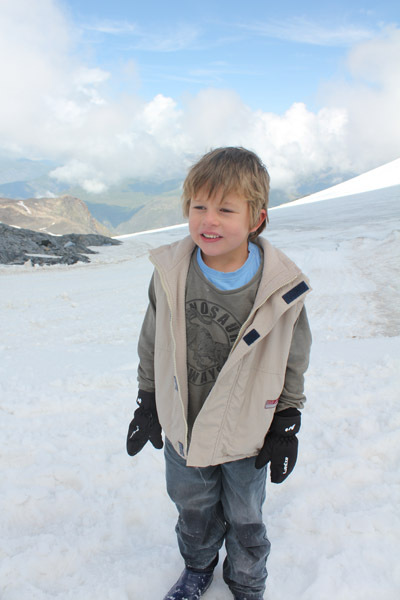 We chose to stay near Les Deux Alpes as it is one of the few ski resorts in France that runs through the summer. 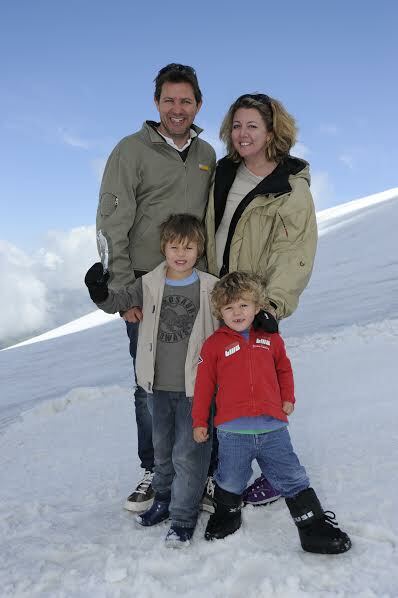 Scott and I have skiied quite a few times in the past, but we haven’t done so since the kids were born. As we aren’t planning on staying in Europe for the winter, we thought this might be a great opportunity to show the kids snow as Tom had been asking to see if for about a year. We parked just outside the lifts, bought passes and headed for the queues to take the first lift up the mountain. Scott and I had forgotten that we normally need photos for lift passes, but luckily they took them for us and sent us on our way. We were also able to skip the massive queue because we were on foot rather than skiing or snowboarding. At the bottom of the mountain in the village there is no snow at all, and as we went higher it got colder and more of the white stuff started to appear. We took two lifts and one train up to the top. The kids though it was brilliant! The train inside the mountain was a bit of an unexpected highlight for both the boys, especially Milo who loves all things that are motorised. Its a long way to the top! Milo was a bit scared! Tom had an absolute ball! He actually squealed when he came out of the lift at the top and ran ran right out into the snow. The then gleefully jumped around and played happily with a huge grin on his face. It took Milo a little longer to get used to the snow. He refused outright to wear gloves so he didn’t like touching anything but after a while he softened and even decided to try eating some. He cheered up a lot when he found a spare snow mobile. Despite telling him there was no way that he would be allowed to play on the roped off vehicle, much to my surprise the ski guy helped him over the barriers and popped him on the seat. The boys absolutely LOVED it! They made up stories and noises for hours and the lovely guy who was on his break didn’t seem to mind waiting for them to finish. Within minutes of arriving up at the top we were having a snow fight. I made a big bunch of snow balls for the kids to throw at daddy. It was so fun to watch them play and to delight in white soft powder. Then Scott made a big pile of snowballs and decided to play (rather than just be the target) and it was so much fun for everyone. The views were breathtakingly spectacular. It really was a very special family day. After all the snow fights we were hungry. Luckily there was a creperie at the top of the mountain with a fabulous view! We had a selection of cheese crepes for lunch followed by salted carmel and chocolate crepes for desert. Sorry there is no photo, we practically inhaled them! The view from our table wasn’t too bad either! There was also a look out up at the 3300m top and the view was awesome. The boys scrapped some ice off the plaques and played with the large shards which melted very quickly in their hands. The trip back was also lovely as we had plenty of time to enjoy looking at the view whilst going down. I loved seeing the bikes and hikers. There was even one couple with a dog who took the lift to the top and then hiked back down and we managed to spot them from the lift.